We will examine closely how people live in "cool towns" or green towns and how they survive using local materials, resources especially energy from the sun. They are inhabitants of a community called "EARTHSHIP"
An earthship is a type of passive solar house made of natural and recycled materials. The Earthship was designed as a structure that would exist in harmony with its environment and be freed from the constraints of modern shelters which rely on centralized utilities. It is important that the Earthship creates its own utilities as well as uses readily available and sustainable materials. In order to be entirely self-sufficient the Earthship needs to be able to handle the three systems of water, electricity, and climate. While these systems are not exclusive to Earthships, a properly designed Earthship must have these systems. Designed and marketed by Earthship Biotecture of Taos, New Mexico, the homes are primarily constructed to work autonomously and are generally made of earth-filled tires, using thermal mass construction to naturally regulate indoor temperature. They also usually have their own special natural ventilation system. Earthships are generally Off-the-grid homes, minimizing their reliance on public utilities and fossil fuels. Earthships are built to utilize the available local resources, especially energy from the sun. For example, windows on sun-facing walls admit lighting and heating, and the buildings are often horseshoe-shaped to maximize natural light and solar-gain during winter months. The thick, dense inner walls provide thermal mass that naturally regulates the interior temperature during both cold and hot outside temperatures. The roof of an Earthship is heavily insulated – often with earth or adobe – for added energy efficiency. The interior climate of an Earthship is stabilized and made comfortable by taking advantage of many phenomena. Mainly, the Earthship tries to take advantage of the properties of thermal mass and passive solar heating and cooling. Examples are large front windows with integrated shades, trombe walls and other technologies such as skylights or Track Rack solar trackers (dualling as an energy generation device and passive solar source. The load-bearing walls of an Earthship, which are made from steel-belted tires rammed with earth, serve two purposes. First, they hold up the roof, and second, they provide a dense thermal mass that will soak up heat during the day and radiate heat during the night, keeping the interior climate relatively comfortable all day. 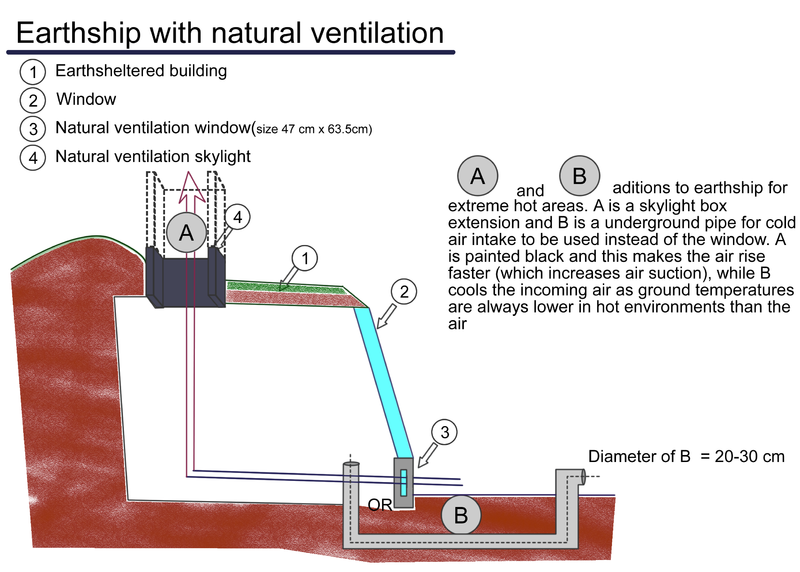 In addition to high thermal mass, some Earthships may be earth-sheltered. The benefits of earth-sheltering are twofold because it adds to the thermal mass and, if the Earthship is buried deep enough, allows the structure to take advantage of the Earth's stable temperature. The Earthship is designed in such a way that the sun provides heating, ventilation, and lighting. To take advantage of the sun, an Earthship is positioned so that its principal wall, which is nonstructural and made mostly of glass sheets, faces directly towards the equator. This positioning allows for optimum solar exposure. To allow the sun to heat the mass of the Earthship, the solar-oriented wall is angled so that it is perpendicular to light from the winter sun. This allows for maximum exposure in the winter, when heat is wanted, and lesser exposure in the summer, when heat is to be avoided. Some Earthships, especially those built in colder climates, use insulated shading on the solar-orientated wall to reduce heat loss during the night (Reynolds 2000). The earthships usually use their own natural ventilation system. It consists of cold(er) air coming in from a front ("hopper") window, especially made for this purpose and flowing out through (one of) the skylights that are placed on the earthship. As the hot air rises, the system creates a steady airflow - of cooler air coming in, and warmer air blowing out. 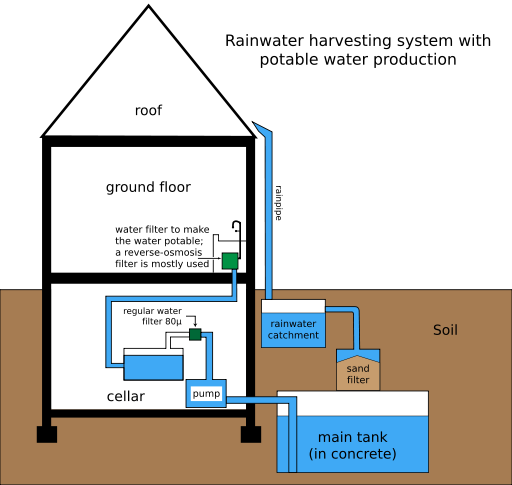 Greywater, water that has been used and is unsuitable for drinking, is used within the Earthship for a multitude of purposes once it is reclaimed. First, before the greywater can be reused, it is channeled through a grease and particle filter/digester and into a 30”-60" deep rubber-lined botanical cell, a miniature "living machine", within the Earthship. The Living Machine is an intensive bioremediation system that can also produce beneficial byproducts, such as reuse-quality water, ornamental plants and plant products--for building material, energy biomass, animal feed. Aquatic and wetland plants, bacteria, algae, protozoa, plankton, snails and other organisms are used in the system to provide specific cleansing or trophic functions. The tidal process operates outdoors in tropical and temperate climates. In colder climates, the system of tanks, pipes and filters may be housed in a greenhouse to prevent freezing and raise the rate of biological activity. The latest generation of the technology is based on fixed-film ecology and the ecological processes of a natural tidal wetland, one of nature’s most productive ecosystems. The diversity of the ecosystem produced with this approach allows operational advantages over earlier generations of Living Machines and over conventional wastewater treatment technologies. This filter with imbedded plants can potentially also be used to produce food (by using a fruit tree, ...). Oxygenation, filtration, transpiration, and bacteria-encounter all take place within the cell and help to cleanse the water (Reynolds 2000). Within the botanical cell, filtration is achieved by passing the water through a mixture of gravel and plant roots. Because of the nature of plants, oxygen is added to the water as it filters, while nitrogen is removed. Water taken up through the plants and transpired at their tops helps to humidify the air. In the cell, bacteria will naturally grow and help to cleanse the water. Water from the low end of the botanical cell is then directed through a peat-moss filter and collected in a reservoir or well. This reclaimed water is then passed once more through a greywater board and used to flush conventional toilets. Often, any greywater that is made at earthships is not polluted enough to justify treatment (its "pollution" being usually just soap, which is often not environmentally damaging). At earthships, the use of plants placed at outlets of fixtures is then practiced to regain the water and the nutrients lost (from the soaps, etc.).. Usually, a single plant is placed directly in front of the pipe, but mini drain-fields are also sometimes used. The pipe is made large enough (5,08 cm) so that the formation of underground gas (from the greywater) is avoided. This is done with kitchen and bathroom sinks, and even showers, washing machines, and dishwashing machines. The plants are usually placed indoors with the sinks and outdoors with the washing/dishwashing machines and shower (to avoid indoor "floods"). Also, with the latter, larger drain-fields are used instead of a mere plant being placed before an outlet. Earthships are designed to catch and use water from the local environment without bringing in water from a centralized source. Water used in an Earthship is harvested from rain, snow and condensation. As water collects on the roof it is channeled through a silt-catching device and into a cistern. The cisterns are positioned so they gravity-feed a WOM (water organization module), that filters out bacteria and contaminants, and makes it suitable for drinking. The WOM consists of filters and a DC-pump that are screwed into a panel. Water is then pushed into a conventional pressure tank to create common household water pressure. Water collected in this fashion is used for any household activity except flushing toilets the conventional way. Rather, the water used for flushing toilets has been used at least once already: frequently it is filtered waste-water from sinks and showers, and described as "Greywater". Earthships are designed to collect and store their own energy from a variety of sources. The majority of electrical energy is harvested from the sun and wind. Photovoltaic panels and windturbines located on or near the Earthship generate DC energy that is then stored in several types of deep-cycle batteries. The space in which the batteries are kept is usually a special, purpose-built room placed on the roof. Additional energy, if required, can be obtained from gasoline-powered generators or by integrating with the city grid. Earthship Biotecture that is simply attached to a wall on the interior of the Earthship and wired in a conventional manner. It includes the necessary equipment such as circuit breakers and converters. The energy run through the Power Organizing Module can be used to run any house-hold appliance including washing machines, computers, kitchen appliances, print machines, vacuums, etc. Ideally, none of the electrical energy in an Earthship is used for heating or cooling. Implementation of ecological engineering has focused on the creation or restoration of ecosystems, from degraded wetlands to multi-celled tubs and greenhouses that integrate microbial, fish, and plant services to process human wastewater into products such as fertilizers, flowers, and drinking water. Potential applications of ecological engineering in cities have included the field of landscape architecture, urban planning, and urban horticulture, which can be synthesized into urban stormwater management. Potential applications of ecological engineering in rural landscapes have included wetland treatment and community reforestation through traditional ecological knowledge. Recent lifestyle and habitat planning examples include the permaculture movement. Earth is made up of many ecosystems existing in balance with one another. In the 1970s, Bill Mollison, an Australian wildlife biologist, coined the term permaculture when he realized that the way diverse elements in nature worked together to supply their collective needs could be adopted to create agricultural systems. In nature, everything has a job to do, often many jobs, and those jobs benefit the whole. LIke the bees and ants they live in colonies where leaders and ant soldiers do their jobs where everyone benefits. We humans are the same. There is life cycle to nature and like our planet earth, we belong to this human and natural cycle processes of birth to decay to a new life. Trees provide shade and protection, decaying plants enrich the soil, both trees and plants feed birds and other wildlife, and birds eat insects that are a threat to the plants and trees. It's an old idea updated to meet today's challenges. 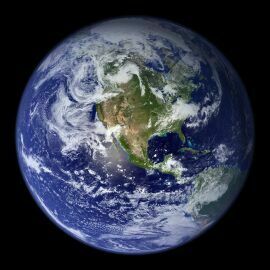 Help the planet, we all live on this ship called Earth! that's in balance with the environment is one of the goals of the green movement. Some green communities are ambitious, trying to integrate a number of systems at once, while others try to take one or two elements at a time, like energy or food production, and adopt more features of green living according to long-term planning strategies. In green communities, ideas overlap and work together to achieve balance. This is a key feature in any sustainable system. Each part contributes to the whole, and the whole is made up of many parts that work in harmony. We can see this in the way green communities address the challenges of transportation and building. This video shows a glimpse what a model communities could be and should be. We will explore its basic parts and hopefully learn from its ideas. Traveling from place to place takes resources, like energy and a vehicle . . . or does it? If you lived a block from where you worked and shopped, you could walk or ride a bike. Green communities encourage building practices that consolidate resources, like business parks and shopping centers, to bring everything closer together. It turns out that bringing things closer together is a good thing in a number of ways. Smaller buildings need less energy to heat and cool, and they can even be made with more eco-friendly materials, like straw, bamboo and compr essed Earth. Smaller, more efficient building design results in smaller neighborhoods; smaller neighborhoods help make smaller towns; and smaller towns require fewer resources. The town of Hull, Mass., sits along the coastline and regularly experiences high winds. This small New England town has managed to turn a windy day into a windfall by building wind turbines to provide for its energy needs. This example of energy self-sufficiency is leading the way for other communities looking for solutions to spiraling energy costs. Wind power is green power that can serve entire communities like Hull. About 80 percent of the energy generated in the world today comes from fossil fuels. The resulting pollution has led to huge problems for the environment, like an increase in greenhouse gasses, and the ecological disasters associated with oil spills and strip mining. The world needs energy, but there are resources other than fossil fuels that can generate power [source: 4EcoTips]. You don't have to live in a green community to start developing greener water habits. If you have an older home, your toilet could be using three to five gallons of water per flush. Compare this to the new 1.6-gallon per flush toilet models on the market today. According to the U. S. Environmental Protection Agency (EPA) replacing all of these old, water-wasting toilets would save about two billion gallons of water each and every day [source: Green Living]. Want some other water saving tips? Turn off the water when you brush your teeth. Harvest rainwater for your garden by installing a rain barrel under your downspout. Cutting back on your water use and harvesting rainwater saves money and helps to preserve the municipal and natural water resources in your area. That's a good thing for you and the environment. Green communities recognize that water is a precious resource and we have to share. Water looks abundant, but it's really not. Only about three percent of the Earth's water is fresh water. Without maintaining a delicate balance in which unpolluted water is available to people and the surrounding environment, unexpected problems arise, often with disastrous results [source: USGS]. Small Building consumes less energy! It turns out that bringing things, people, closer together is a good thing in a number of ways. Smaller buildings need less energy to heat and cool, and they can even be made with more eco-friendly materials, like straw, bamboo and compr essed Earth. Smaller, more efficient building design results in smaller neighborhoods; smaller neighborhoods help make smaller towns; and smaller towns require fewer resources. Green Solar Home: Imagine living in a place where there is no utility bills, limitless source of food from your garden roof top or vegetable plots, unlimited of power to provide energy to heat your home, kitchen. and daylighting to provide you with good lighting from the sky. The building industry is one of the biggest causes of our current environmental crisis. According to the United States Green Building Council (USGBC), building construction and operation represents 70 percent of electricity consumption, 39 percent of energy use, 39 percent of carbon dioxide emissions, 40 percent of raw materials used, 30 percent of waste generated, and 12 percent of potable water consumption here. Consider this: An entire acre of forest must be cleared just to build one single 1700 square-foot home [Source: Global Green]. 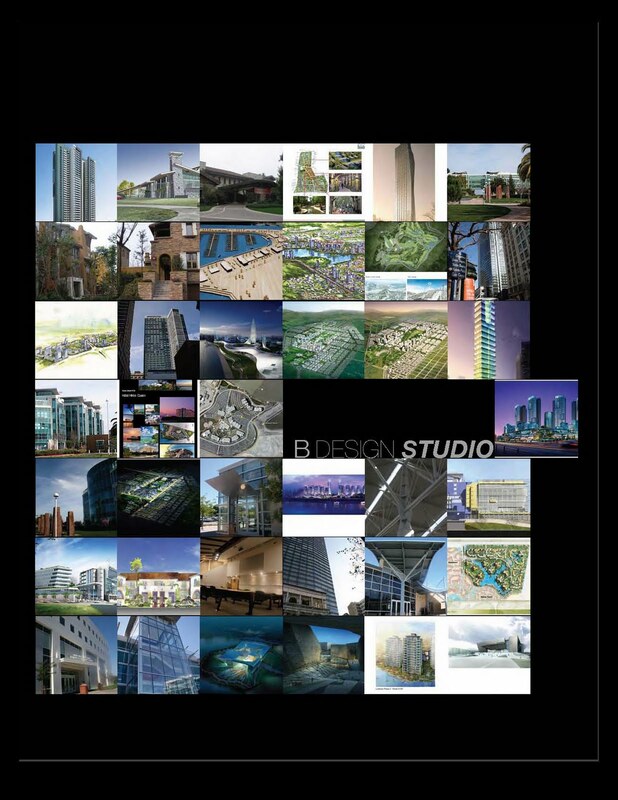 You would expect that with all these resources being expended, we would at least produce greener buildings, right? Wrong. More than one third of the buildings in the United States suffer from poor air quality, leading to $15 billion in productivity losses each year for American businesses [source: Global Green]. In addition to the financial costs of poor air quality, consider its impact on our health. Poor air quality leads to respiratory illnesses, weaker immune systems and a lower quality of life. While the commercial building industry has taken great strides towards streamlining the construction process and producing greener buildings, residential construction has a long way to go. One company that has taken the lead towards creating environmentally friendly homes in the United States is EarthCraft House. Earthcraft is a residential green building program of the Greater Atlanta Home Builders Association in partnership with Southface Energy Institute, both of which are Atlanta based non-profits that has developed its own guidelines and ratings system to help homebuilders create eco-friendly homes. The EarthCraft system is currently the largest system for green home development in the country and fills a much-needed niche in the residential market. Is it possible to harness energy from Garbage and produce enough electricity to power your home, car and electronic gadgets like Ipad? Yes. Humans have an intimate relationship with electricity, to the point that it's virtually impossible to separate your life from it. Sure, you can flee from the world of crisscrossing power lines and live your life completely off the grid, but even at the loneliest corners of the world, electricity exists. If it's not lighting up the storm clouds overhead or crackling in a static spark at your fingertips, then it's moving through the human nervous system, animating the brain's will in every flourish, breath and unthinking heartbeat. The first thing you need to do to go off the grid is to rid yourself of dependence on electricity from your power company. The most common way to do so is by using the sun and the wind to provide your power. Neither concept is new, but more people are turning to these constant power sources to help offset or replace their reliance on electricity fueled by burning coal. You can read in detail about solar and wind energy in the articles How Solar Cells Work and How Wind Power Works -- but we'll explain the general concept here. Residential homes that use solar power typically have photovoltaic (PV) solar panels located on the roof or near the house. These panels contain cells made up of silicon semiconductors. When the sun's light hits the panel, these semiconductors collect the energy and knock electrons loose so they can flow freely. An electric field in the panel then takes these electrons and forces them to flow in one direction, creating an electrical direct current (DC). The DC is then passed through an inverter that simply converts this DC into the alternating current (AC) that your home uses. "The grid" is a common name for the power grid -- the linked system that delivers electricity to the masses. A typical house is connected to power, natural gas, water and telephone lines. Electrical power is a little bit like the air you breathe: You don't really think about it until it is missing. Power is just "there," meeting your every need, constantly. It's only during a power failure, when you walk into a dark room and instinctively hit the useless light switch, that you realize how important power is in your daily life. Going off the grid means shunning these public utilities in favor of creating your own energy. Some homeowners choose to be partially off the grid by supplying their own electricity and ditching their phone line, while relying on the convenience of city water and sewage. Others choose to live completely off-grid by digging wells or using a cistern system to collect water. A septic tank takes care of the sewage and, just like that, no more water bill either. In this article, we'll cover what it takes to go off-grid. We'll learn about solar and wind power and how you can get your water from above or below. We'll also look at the lifestyle changes that come with living off the grid. Powering vehicles with garbage sounds as far-fetched as Mr. Fusion, but it's already being done on a small scale. Creating liquid fuel from solid garbage involves a process called gasification, where heat -- not flame -- transforms carbon-based solids into synthetic gas, which can then be distilled into ethanol, an alcohol that's already added to the gasoline supply in many states, and used in cars already on the road. The idea of creating liquid fuel out of solid biomass has been around for a long time. The gasification process was discovered in Belgium in 1609, using wood and coal. Syngas was also known as "town gas," and it was used in streetlamps that had to be manually lit by a lamplighter. During the fuel shortages of World War II, European vehicles were fitted to use syngas made from wood chips, and Apartheid-era South Africa used the same technology when it was under worldwide sanctions. In other words, this stuff has been around for a very long time. Coal gasification is sometimes called "clean coal" because it can be used to generate electricity without belching toxins and carbon dioxide into the atmosphere. But it's still based on a nonrenewable fossil fuel. And it still requires mining operations that scar the Earth and leave behind toxic wastes of their own. Wood gasification -- or biomass gasification, to be more technically correct -- may provide a viable alternative. Biomass is considered a renewable energy source because it's made from organic materials, such as trees, crops and even garbage. Believe it or not, one of the main uses of wood gasification has been to power internal combustion engines. Before 1940, gasification-powered cars were occasionally seen, especially in Europe. Then, during World War II, petroleum shortages forced people to think about alternatives. The transportation industries of Western Europe relied on wood gasification to power vehicles and ensure that food and other important materials made it to consumers. After the war, as gas and oil became widely available, gasification was largely forgotten. A future petroleum shortage, however, may revitalize our interest in this old technology. The car driver of the future may ask to "fill 'er up" with a few sticks of wood instead of a few gallons of gas. Agricultural residues are left after farmers harvest a commodity crop. They include wheat, alfalfa, bean or barley straw and corn stover. Wheat straw and corn remnants make up the majority of this biomass. Energy crops are grown solely for use as feedstocks. They include hybrid poplar and willow trees, as well as switchgrass, a native, fast-growing prairie grass. Forestry residues include any biomass left behind after timber harvesting. Deadwood works well, too, as do scraps from debarking and limb-removal operations. Urban wood waste refers to construction waste and demolition debris that would otherwise end up in a landfill. Pallets -- flat transport structures -- also fall into this category. The choice of feedstock determines the gasifier design. Three designs are common in biomass gasification: updraft, downdraft and crossdraft. In an updraft gasifier, wood enters the gasification chamber from above, falls onto a grate and forms a fuel pile. Air enters from below the grate and flows up through the fuel pile. The syngas, also known as producer gas in biomass circles, exits the top of the chamber. In downdraft or crossdraft gasifiers, the air and syngas may enter and exit at different locations.